Was Spy at one time to have been directed by Guy Hamilton? The reason for asking is that I have bought a flyer of unknown origin and date, but that which was distributor lead from United Artists and Transamerica stating that the director was Guy Hamilton. The ebay link is here for images. There's a lot more there than just "directed by Guy Hamilton" interesting there. 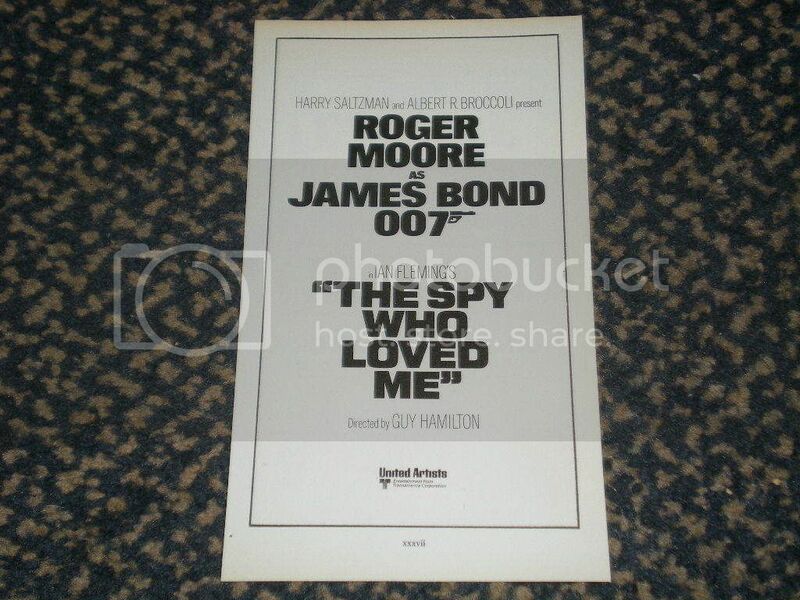 There's "Harry Saltzman and Albert R. Broccoli present" as well as "in Ian Fleming's The Spy Who Loved Me." Any source for when or where this flyer was distributed? Looks like something that would go in a trade magazine. Yeah, it's been documented, the main source I'm thinking of is Steven Jay Rubin's book The James Bond Films, that Hamilton was set to direct his fifth Bond film, but left as he was then slated to direct Superman before leaving that project and Richard Donner taking over (it would have reunited him with his 3-time Bond screenwriter Tom Mankiewicz). Saltzman sold his shares in Eon in late 1975 and Fleming always stated one of the conditions of using the book of Spy was the plot of the book couldn't be done and this was the first film I think to say "Roger Moore as Ian Fleming's James Bond, 007." I'm not near a source that can confirm this, just going by memory. Ah yes indeed, the Saltzman and Broccoli presentation. That hadn't clicked. Yes, I am told it was a Trades magazine insert. On the rear there is a Hammer advert not attached to any film, but with their business address in Wardour street. I am also surprised that the font used for the Spy title is the same as that which was eventually used on the one poster campaign. As an aside, and bearing in mind that which hung on the success of this film, to this day it surprises me that the campaign for this film was not as illustrious as that for Moonraker. In the US, there was but one poster. In the UK, I think there was a little seen calendar quad and of course the Marler campaign as pertinant to the Odeon chain. I have also seen somewhere that EON had talks with Peter Hunt after Hamilton left. This makes sense since Hunt did Gold with Moore 1974. This could also explain why John Glen came back to Bond again (he was working with Hunt back then). John Glen was one of those promoted editors. He was on Spy and Moonraker prior to Eyes' directing duties. Peter Hunt was on neither. I am just saying that Glen was away for DAF-TMWTGG but came back in TSWLM (maybe because he was part of Hunt's crew, I don't know). One can only wonder how Spy would have turned out had Hamilton shot it. IIRC there was a thread discussing it here on CBN a while back. Anyway, yes, Hamilton was originally scheduled to direct. I assume he wasn't paid for it, unlike Superman where IIRC he was paid in full even though he didn't direct a single frame of the film. Dead link. Do you have a copy or have another link? I'd like to see it? but left as he was then slated to direct Superman before leaving that project and Richard Donner taking over (it would have reunited him with his 3-time Bond screenwriter Tom Mankiewicz). No, it wouldn't have. Mankiewicz didn't come on board Superman until after Richard Donner took over. In the UK, I think there was a little seen calendar quad and of course the Marler campaign as pertinant to the Odeon chain. Love to see both. Anybody have any caps to share? Yes, ARB did contact Peter Hunt who was vainly struggling to set up a film with/for Sophia Loren and Carlo Ponti. However this had nothing to do with John Glen. You see, John Glen and Peter Hunt had a very bad falling out on "South at the Devil". Hunt apparently fired Glen. Source: Alan Hume. I assume ARB brought John Glen back for TSWLM because Glen had directed OHMSS's ski chases. The other two posters can be seen here. Yeah - I think so too. This sort of early release stuff that is then subject to title and production changes amuse me. I also have an early presskit for Licence Revoked and a business card for Peter Lamont when it was called From a View to a Kill. These must be treasures for collectors, such items' number is probably very, very small. Yeah - I guess so. Let me know if images would be appreciated. I am happy to sort and display. On the other side of the coin, I did manage to purchase a perfectly legit and standard original Dr No UK Quad poster yesterday. The legit and the weird both appeal. Yes, SHOUT at the Devil. Don't know how that typo slipped through. 1) The Cubby and Harry situation had made life impossible for all, as they couldn't agree on anything. 2) Richard Maibaum had written the first draft of TSWLM. In Hamilton's words "I didn't want to work with him and he didn't want to work with me"
Where did you get this quote from? John Landis says he was working on the script when GH was still attached to direct. Furthermore I don't believe Maibaum came on board until just before Christopher Wood. I was under the impression that there either was no director or Lewis Gilbert was by this point signed to direct. Where did you get this quote from? John Landis says he was working on the script when GH was still attached to direct. John Landis! Did not know that. Fascinating. Like TND, I'd always read/thought/learned from greater minds or some blogger, that TSWLM had had all number of writers having a go. Would always loved to have learned more about the alleged contribution of Anthony Burgess who had apparently thrown about the idea of long-haired hippy-style 70s terrorists as the villains (either read that here or over at the old HMSS website). I love TSWLM that we got in that Silver Jubilee year, but there's a part of me left wishful thinking for whatever the likes of a Landis would have cooked up. Landis supposedly handed in a script with Bond hiding from killers in a church - in crucifixion pose. The tale is that this earned him the door on the project. In spite of hardly any rules for TSWLM surprisingly often writers came up with submarine-based themes, must have been something in the air back then. Some also thought about a return of FRWL's Tanya, you can still find traces of that idea in Wood's film tie-in, which reads in parts like a sequel to FRWL. Common knowledge that Landis worked on the script. Actually, it was Richard Maibaum who came up with the long-haired hippy brigade idea. Anthony Burgess merely reworked his 1966 novel "Tremor of Intent". You can find more details about Burgess's treatment/script elsewhere on the net. Apparently Burgess wrote it in 1975 which would have made him one of the first writers on the project. I suspect that with the success of Spielberg's Jaws, the producers probably wanted a water-logged adventure. If the heroine had to be a Russian spy, then a nuclear sub idea would probably be the next and most logical step. Also possible that Broccoli told the writers to incorporate said ideas into the plot. Yes, this really makes the most sense, there having been some 'make it water-based' briefing in advance most likely. Reading past accounts of TSWLM's production it would also seem a number of writers have been working on it simultaneously, kind of a contest. I've heard it's a good book, Hilly. There was a trade advert similar to Simon's flyer which announced the film for 1976 (reproduced in Some Kind Of Hero). Guy Hamilton was to direct the film and was initially inspired by a picture of a submarine. As Danjaq fell apart, Hamilton's position became untenable and he was being offered serious money by the Salkinds to direct Superman. Otherwise, Hamilton would have been the first director to helm 5 Bonds.